Scraps! and the new book, "Scraps, Inc."
I'm talking scraps today! The inspiration for this post is Lucky Spool's great new book Scraps, Inc, Volume 1, compiled by Susanne Woods. I think Lucky Spool is publishing some of the best new quilting books! Scraps Inc, Vol. 1 is a collection of 15 Block-based quilt designs for the Modern Quilter. These patterns are mostly Modern Traditionalist so they should appeal to anyone who quilts. The book's starts with the statement that if you are looking for a book about scrap quilts, you probably a "prolific quilter." This is reflected in the patterns in the book which run 4-6 pages long. They have great diagrams and clear directions, but they are based on the assumption that you know how to piece block. There is no information about finishing the quilt once you have a completed top. This is totally appropriate for their target audience of experienced quilters. I'm delighted the pages in this book are used for quilt designs rather than information about making quilts which is readily available from many other sources. Amy Friend who lives here in Massachusetts and blogs at DuringQuietTime.com, has a paper pieced design called "Twinkle" in the book. I really like her palette of Spring greens and greys. You can see her quilt at the link above. Her post about this quilt also includes a discount code that is good until December 1, 2014 if you want to purchase a copy. One of my favorite quilts in the book is "Autumn Flight" created by Beth Vassalo. Click on her name to see her great quilt. She has floated her flying geese so she doesn't loose any of her points She also picked fabrics with prints that echo the flying geese motif. It's a great quilt. I have to say, the designers in this book have the best collection of scraps! Each of the contributors in the book has a sidebar with information about how they manage their fabric scraps. It's great fun to read about how they sort and store their scraps. So I thought I would share how I store my scraps. 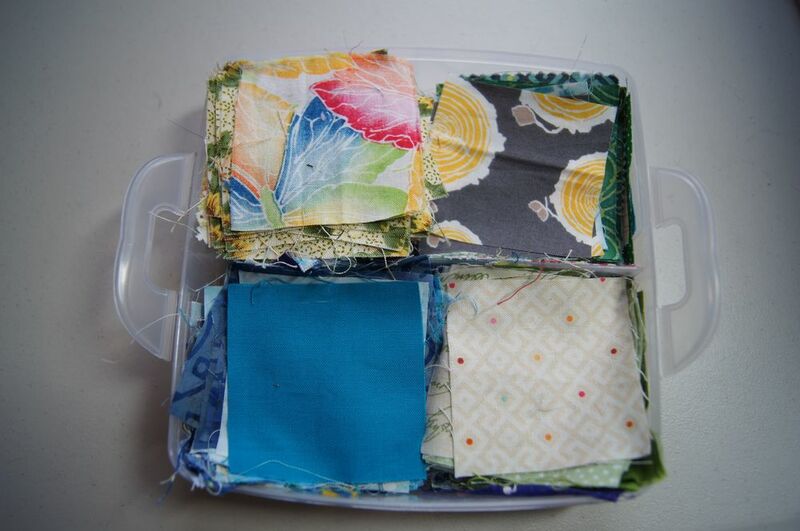 If I have scraps with left over yardage, I fold the scraps into the yardage and put them away in my color coded fabric bins. But lots of times I have scraps that are the end of the fabric. I cut those scraps into a size that saves the largest amount of useable fabric. I try to do this as I am finishing cutting fabric for a quilt. Fabrics that are cut to a size go into stack and click together plastic containers. The larger container is divided into sections--these store 2 inch strips, 2 inch squares, 3 inch squares, 3 1/2 inch squares, 4 inch squares and "bars" of fabric of varied width and length. (I'm no longer cutting fabric "bars"--it makes more sense to keep the fabric as strips which I can cut to size as needed). The smaller bin has 2 1/2 squares sorted by color in the top layer. The bottom 2 layers have 5 inch squares. On the left is a bag of 1 1/2 inch squares. (I have no idea how I will use these yet!) Next to that is a bag of triangles which are scraps from bindings. Those I'm sewing onto white squares to make a quilt pattern from Sunday Morning Quilts. On the right is my bag of strings. These are any strips smaller than 2 inches wide. I've trimmed them to be straight strips which I find more useful in my projects. I also keep a bag of 2 1/2 strips. Finally I have one large clear plastic bag of "stuff". 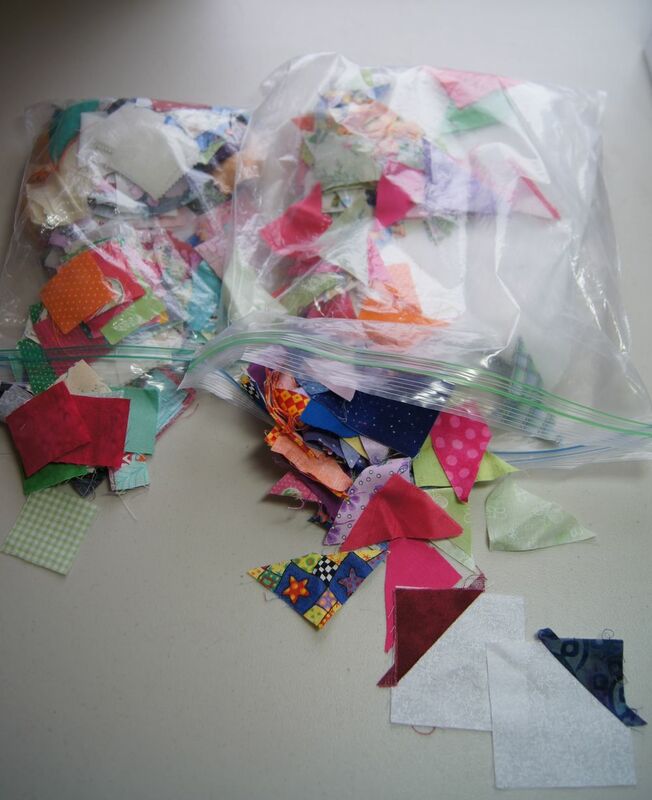 Recently I rummaged through it looking for scraps for the new Bonnie Hunter Mystery quilt that starts this weekend. I found that I took out a number of pieces of fabrics and reassigned them to the stash! I guess my definition of "scrap" has changed over time! If you have a collection of scraps, pick up a copy of Scraps, Inc. It will give you new inspiration about how to turn your scraps into great quilts!